FixThePhoto team designed this Orange and Teal Lightroom preset free to give photographs with nature background a trendy combination of colors. Fast and easy to download with one click. Add rich and bright colors in your photos. Are you a popular Instagram blogger, who needs more followers and likes? Have any problems editing your images in Lightroom? 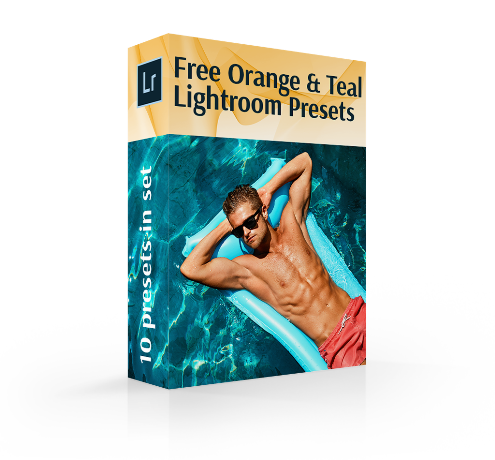 No matter what your purpose is, these Teal and Orange free Lightroom presets will certainly be useful. FixThePhoto is glad to give away a new bundle of professional free Lightroom Teal and Orange presets. You need several minutes to download it and make photo editing faster. Each Teal and Orange Lightroom preset may be individually customized to match your photographic style. If you haven’t found it, you can use this package as an inspiration source and experiment with different color effects. The results will be impressive. Having downloaded this bundle, you get 10 plug-ins to make your photos near beaches, sea, mountains, or lakes really pop. Forget about long photo color correction. Now you can make each photo original. These free Lightroom Teal and Orange presets can quickly improve the general coloring. The “pale” colors become brighter and fresher. The Teal and Orange free Lightroom presets primarily influence orange and blue tones, making them more prominent. You can use these presets to adjust other parameters, such as whites, contrast, shades, etc. Your picture becomes clearer with the main accent on blue and orange shades. The presets were created and tested by our skillful photo retouchers. We guarantee fast work and cool results. If your photos lack light, these free Lightroom presets Orange and Teal will improve the picture quality. Teal&Orange Lightroom Preset #1 "Confetti"
If you take landscape photography or enjoy shooting people against the natural background, download this preset. It helps accurately separate horizon, making the pale sky truly blue. Depending on the contrast settings, you can get intense or light blue shade. Orange&Teal Lr Preset Free #2 "Summer"
Judging by the title, you have probably understood that this Teal and Orange Lightroom preset is good for summer shots with people wearing colorful clothes. Thus, you can highlight the person in the foreground, while the background becomes a harmonious element of the composition, which helps emphasize the mood of the picture. Teal&Orange Lr Preset #3 "Greenery"
If you wish to show the personality of your model posing in the greenery, you’ll definitely like this Teal and Orange Lightroom preset free. It is also effective when there are lots of objects of the same color in the background, which slightly differ in the hue. For example, if there is light green grass and “washed out” trees that merge into one spot, you can try this preset to achieve a more balanced look. Lr Preset Orange and Teal #4 "Amber"
Either because of poor lighting or improper camera settings, you may get too lifeless photos. You can quickly fix this defect, using Teal and Orange Lightroom preset #4. Bring some cheerful vibes to the shot. Free Teal&Orange Preset #5 "Pumpkin"
This preset works really great if you originally have a photo with a blurred background. So, there are no distant objects to hide but you simply need to bring out the blue/orange shades. You may also try this preset, if the background is one-color. Adobe Lr Preset #6 "Forest"
This Orange and Teal Lightroom preset free brightens all the colors of the pictures with the main accent on the blue and orange tones. As a result, you get a more balanced image. Free Lightroom Preset #7 "Matte"
This is one of the most popular free Lightroom Teal and Orange presets among portrait photographers. It helps beneficially enhance the skin tone, especially if the model is wearing blue or orange swimsuit, short dress or other summer clothes. Preset Lr Orange and Teal #8 "Darken"
Need to increase contrast, but don’t want to do it manually? Use this Orange and Teal Lightroom preset. It is mainly created for landscape, street and wildlife photography, but you can experiment with wedding and newborn shots as well. Think that bright colors make the picture more atmospheric and dynamic? You’ll definitely like the way this preset influences a photo. If you photograph people against a long stripe of the ocean or a clean swimming-pool, use this plug-in to make the water look bright, but realistic. Orange&Teal Lr Preset #10 "Retro"
You get complete freedom with the last preset from this bundle. It is equally effective for landscape, portrait, wedding, street, and lifestyle photography. Using it, you can increase clarity and draw attention to the model, surrounded by beautiful nature. This Teal and Orange Lightroom presets free collection is universal, as you can use it for any photography genre, be it a portrait or wildlife photo. If you have an image with blue or orange tones which looks somehow bleak, use any plug-in from this bundle to enhance these colors and make the entire photo composition pop. If you are a Lightroom’s amateur and don’t know how to regulate light and depth of field manually, you’ll find these 10 free Lightroom presets super useful. All the adjustments are done with several mouse clicks. Besides, you can accentuate the main object separating it from the background.